What makes us so 'Genius' you may ask? It's the fact we blend the entire inside of the coconut into a bottle. We source organic, fresh, young thai coconuts, called 'Nam Hom' coconuts. We extract the coconut water and the coconut meat and blend the two together to make a creamy, delicious & filling organic coconut smoothie. Move over coconut water, there is a new coconut drink in town! Whole Coconut and Nothin' But the Whole Coconut! We blend real whole coconut into every bottle and leave nothing behind. 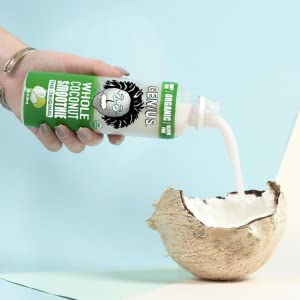 You are getting ALL the benefits from whole coconut including MCTs, Good Fats, Protein and Fiber from the coconut meat, and potassium & electrolytes from coconut water, It's truly the best of both worlds! Have our delicious coconut smoothies for breakfast, as a snack, a pre/post workout, or for dessert. You can also blend it into a smoothie, pour it on your granola or cereal, and even cook with it! There are many use occasions for Genius, and it all comes out amazingly delicious! Our Mission: We Up-Cycle Our Coconuts! 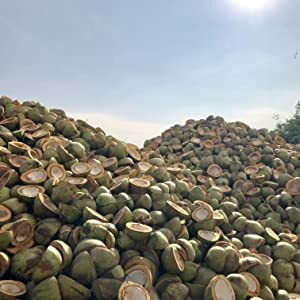 After extracting the coconut water and coconut meat, we donate the remaining coconut husk/shell to local municipal organizations in Thailand. 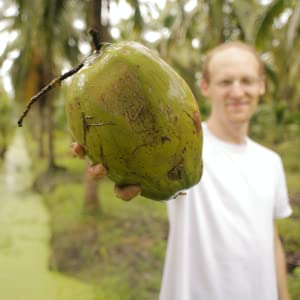 The coconuts are then used as clean, alternative energy to power local communities and cities. We truly use the ENTIRE coconut and nothing goes to waste!